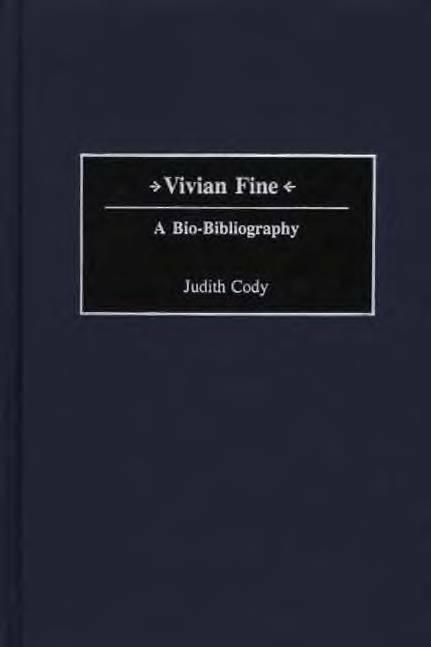 Vivian Fine: A Bio-Bibliography, is about the life, times and the amazing modern music career of American composer Vivian Fine. She ranks as the most important female composer in American music. Vivian Fine's contribution as a composer spanned almost the entire 20th century in both her music's form and in her international reputation. Vivian Fine was born in 1913. She wrote her first piece in 1927 under the guidance of the brilliant composer, Ruth Crawford (who married into the famous Seeger family). A few years later, the teen-age Vivian became a protege of Henry Cowell. 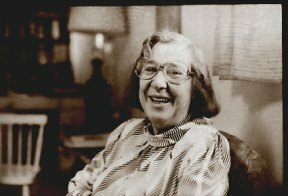 Not long thereafter, legendary composer Aaron Copland lavished praise upon her music when he took her into his avant-garde "Young Composers Group." She was working as a pianist for a living, composing her own music in her free moments, with all the bright and new composers of the new 20th century American music idiom. All this happened at the height of the Depression in America which turned out to be one of the heights of arts creativity in New York City. Within the depths of a nation's poverty people somehow excelled in creating new and exciting arts in many disciplines. This is a most interesting historical comment on the nature of humans and their wonderful powers of creativity. This period is the birthing of the new and exciting music: jazz was becoming embedded in the heart of the United States. The U.S. was creating its own dance styles in every form (think jitter-bug, think modern ballet) for the first time the country was creating a classical music form that was not just a European carbon copy. Vivian Fine was born to this New Music episode of U.S. music history as she continued to create and adapt this unique American configuration of sound to the changing times of the last century. My book took more than ten years of research and writing; much of my life was put on hold until the book was complete. Tragically, Vivian Fine did not live to see the final version, though she saw many of the chapters along the way. 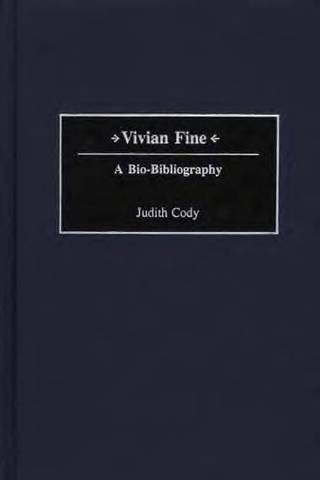 I knew Vivian Fine personally and lost a valued friend as well as a colleague when she died on March 20, 2000. Day by day as I explored through the stacks of Fine's early records, a clear window into the 20th century birth of American Modern Music began to emerge. For Fine was not a lone figure, she was an integral part, composer and confidant, a colleague to the critical pioneers in America's new music age. She acted alongside and with them: Henry Brant, Charles Ives, Roger Sessions, Henry Cowell, Ruth Crawford, Aaron Copland, Martha Graham and Doris Humphrey, yet many other music and modern dance celebrities. She ranks today as the matriarch of American Modern Music. Vivian and her husband, Benjamin, made me feel a bit like a houseguest in their comfortable family home. The house stood on a gentle hillock surrounded by lush lawn where Benjamin's enthralling stone sculptures sat in a natural array among the grass and plants. Often, Vivian prepared we three a lunch with a greens salad adorned with huge vivid tomatoes that Benjamin would bring in directly from his garden, then he would slice them just before serving for ultimate freshness. 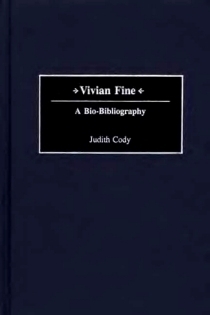 Vivian Fine: A Bio-Bibliography is now in over 270 major libraries in the world according to the World Catalog. Click on the link below to find it near you. Click here to find Judith's book in a library near you. USA, UK, Europe, Japan, other. "Cody successfully captures [Vivian] Fine's position as the matriarch of American modern music. Highly recommended without reservation for all collections." "This is another strong pillar for the world's music reference libraries and the shelves of serious enthusiasts. It will have a strong appeal to dedicated students of U.S. music of the twentieth century as well as those who specialise in the cruel pilgrimage female composers have had to make. Vivian Fine was born on 28 September 1913 in Chicago, Illinois. She was befriended by another and better connected composer, Ruth Crawford. In 1932 her Four Polyphonic Piano Pieces showed up in the First Festival of Contemporary American Music at Saratoga Springs, upstate New York. By the mid-1930s Fine was working with many women choreographers. At about this time she began lessons with Sessions and Georg Szell. Her style was mostly atonal. She looked back on her spell at Bennington College, Vermont as one of the most fruitful times of her life. The apex of her career came with Drama for Orchestra--an SFSO commission. This is a work suggested by a group of paintings by Edvard Munch. She retired from Bennington in 1987. Vivian was killed in a car accident on 20 March 2000. Bear in mind that this is primarily a reference work. That said, there is a very personable introduction and a 30-page biography that is just about ideal in its mix of historical incident and communicative musical description. From there you can jump off into the annotated bibliography (completed with extracts from the writings listed), a catalogue of her works and performances, a list of her performances as a pianist, a discography (only 21 entries), and a chronology year by year. The appendices tell us where to find Fine's music, names and addresses of publishers, etc. (I wish there had been more in the way of e-mail contacts and web addresses), analysis of creativity, list of teachers, alphabetical and generic lists of works, settings of poetry by author and an index running to 21 pp. The index has entries by place, institution, people, publication title etc. The authority of Ms Cody's work is never in doubt and the vivid description of Cody's almost two weeks with Fine for between 8 to 10 hours a day is pleasing to read. Ms Cody says that "this book is designed to be as accessible as possible to all those who love music." Her design has been accomplished and the book will open the way to Fine scholars the world over as well as shedding illumination for enthusiasts of Fine's music."